We may be Sunderland fans, who traditionally have deep rivalry with Newcastle, but there are things far more important than any football games. The incredibly sad news that has emerged this week about two Newcastle fans who have passed has left us all shocked and deeply saddened. 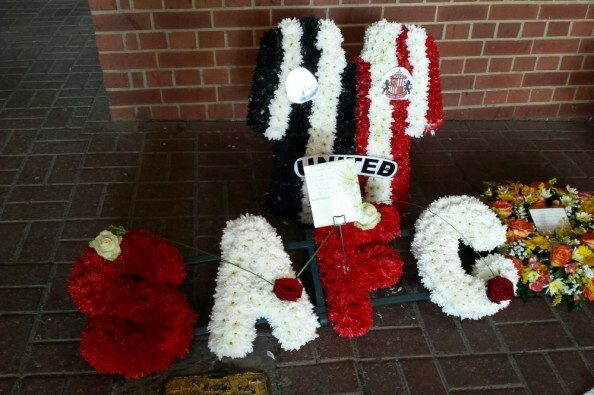 Donating here will help pay for a floral tribute to those fans and to unity between the two clubs. Any extra money will be donated to a charity that has yet to be decided. Thank you for your time, effort and donations. Therefore each charity has received £15,209. Thank you to everyone who has donated, it's been emotional :) This is a fantastic tribute to John and Liam, and to all football fans throughout the world and especially here in the North East. I will post on here the invoice emails from the charities when I get them. Let me know if there's anything else I can help you with today. We're here to help! I'll try my best to respond within 5 minutes during normal business hours. I've now turned off the donations. I have contacted the organisers of the Split Festival and they have been advised to give their contribution directly to the charities for tax reasons. Thank you for all donations, no matter how big or small (and remember the suggested donation was only a fiver), this fund should really make a difference (and not just due to the money that has been raised). I have asked for an invoice which will show all fees/charges and also the final amount to go to the charities (less the £200 for the flowers - let's not forget them!). There is still a chance that SAFC will contribute the fees/charges so I'll keep everyone informed. Thank you for the recent donations. I'm keeping the fund open until we get the money from the Split Festival and then I'll put a final update on here. Hi Alistair, what's up? I can't seem to PM you. rest in his final resting place. I'm not usually in agreement with politicians but no way should Russia host 2018 now. That would be a travesty of justice. I don't care wherever else it is held but to hold it in Russia would be a travesty of justice and unforgivable. From a Villa fan. God bless again boys. Re Stephen Patterson...thats what travel insurance is for. Do you think it would be prudent to hold onto the funds in case they are needed to get the lads back home to the UK. This could end up being an expensive exercise. Let's think about charitable donations once the lads are properly laid to rest. This gesture just gets better and better, what a tribute to John and Liam and a special than you to organiser Gary Ferguson ( Hero ). Yes I am a lifelong Newcastle supporter and proud of it. I just hope the feeling generated by both sets of fans can continue from this point on, rivalry yes, hatred NO! R.I.P lads. From Middlesbrough Official Supporters Club, a collection was made at our meeting tonight. R.I.P.